You are seeing Philly through the eyes of someone who loves it. I’ve been living, working, fighting for social justice, and raising a family in this beautiful dirty city for over 30 years. A lot has changed over that time, but a lot remains: it’s a hard working class town that has seen better days but it’s neighborhoods are alive and vibrant with a rich history and culture. The current national trend of folks leaving the burbs and moving ‘back to the urban core’ has resulted in a particular – potentially explosive – economic, political and social mix. Contradiction, juxtaposition, class conflict, gentrification, love, hate, and friendship mingle against the backdrop of a post-industrial urban landscape still alive with pockets of industry. We work, we play, we live, we love, we fight, we die, we make great sandwiches… and we all live in the shadow of liberty -literally and figuratively. This is a city built on class struggle. That does not make it unique among American cities, but it has it’s own peculiar arc of historic political and economic development that influences us today. An early colonial mercantile, industrial, banking, administrative, and government center, Philadelphia is one of the oldest cities in the US. It was a city of brick buildings and cobblestone streets when New York City was still dirt roads and log cabins. And while NY culturally, politically and economically dominates the NorthEast, Philadelphia exists in a cultural and economic orbit of its own. As the decaying pearl in the string of East Coast rustbelt cities strung out along the key manufacturing and transportation corridors of the last century, it is the 5th largest city in the US and the 2nd largest city on the east coast behind NYC. More than twice the size of its largest neighbors Baltimore and DC, it is the poorest large city in the country and in constant competition with Detroit for the bottom economic spot on the list of 25 large U.S. cities. Founded on Quaker principles, on land stolen from the Lenapi tribes, Philadelphia was a beacon of religious tolerance and relative social equality and opportunity. It was the 2nd largest english speaking city in the world at the time of the American Revolution and already had a developing urban working class based in printing, artisans, construction, ship building, resource extraction and primary manufacturing for both the domestic colonial market and the British Empire. It was the iron mills of the Philadelphia region that forged the cannons for the continental army and navy. After the revolution it was the new Republic’s first capital city before Washington DC was built, and alongside the colonial english, irish and german proto-working class, indentured servants, and black african slaves, it had an established community of free black skilled workers and intellectuals and an active abolitionist movement. A city with strong working class traditions, many of the earliest recorded strikes in the US occurred in Philadelphia, it was also a key stop on the Underground Railroad. Yet as a major economic center 30 miles from the Mason Dixon line (Delaware was a slave state), Philadelphia had strong ties to the slave trade and the southern plantation economy. 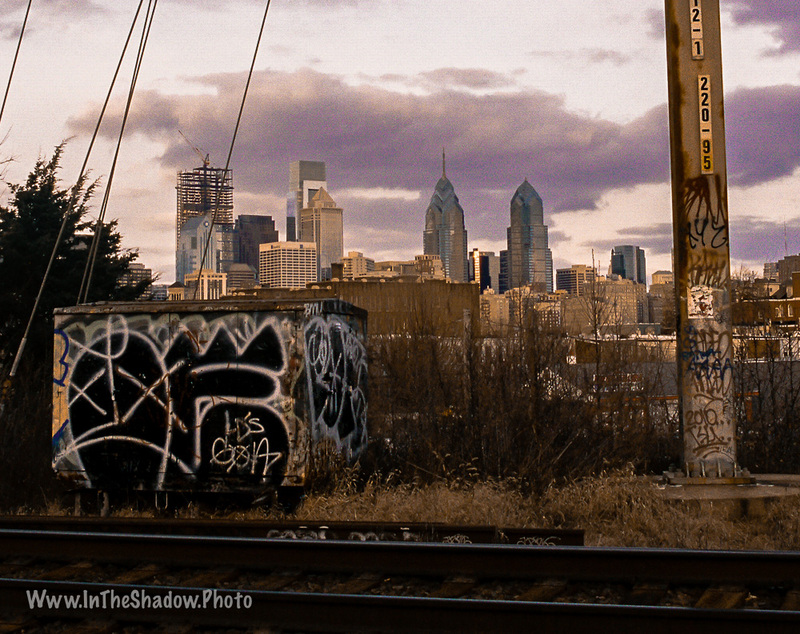 These deep historic conflicting dynamics of class struggle, racism, nativism, immigration, and economic development still effect our daily lives in Philly. In the heart of Old City, Independence Historic Park holds relics of our revolutionary heritage. Near the Liberty Bell, 2 blocks from the building where the Declaration Of Independence was signed, are the foundations of George Washington’s slave quarters used while he was in Philly on business. Across the street are the local headquarters of Dow Chemical and Wells Fargo Bank, and rising from Center City are One & Two Liberty Place, the first skyscrapers to break the local ‘Gentleman’s Agreement’ that no building in Philly would be taller than city hall. Construction of the shining towers was completed in 1987. These towers, symbolic of the dynamic changes taking place in the local economy, are visible from most of Philly’s neighborhoods: working class communities hit hard by deindustrialization and now squeezed by austerity and the gentrifying forces that were unleashed by Liberty Place. The images shown here were shot with various film and digital cameras. The film images were developed and scanned – either by a local lab or myself at home – and digitally processed on my phone or laptop. Most of these images have been taken since 2015, but as a long term project I am also slowly reaching back into my pre-digital archives. All images were uploaded as medium resolution jpg files.